The room has full audio-visual facilities and full wireless internet access. The room is also wheelchair accessibile from the side entrance. 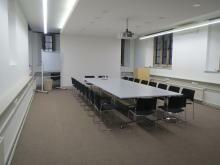 The room is available throughout term time, accommodating a maximum of 50 people in theatre style.